If you happened to catch Der Weg Einer Freiheit on last April’s Heathen Crusade tour with Primordial and Moonsorrow, or bore witness to them pretty much opening up a new portal to raging dimensions beyond with The Great Old Ones, you’ll already know that the Bavarians' propulsive and purifying black metal finds its true calling on the stage. Now the band are about to release their first ever live album, not entirely cryptically titled Live In Berlin –due for release via Season Of Mist Records on March 1 – recorded at the Lido venue last October. Celebrating their 2017, devastating studio album, Finisterre, but ranging across the band’s history, which is due to reach its 10-year mark later this year, Live In Berlin reaches a cathartic critical mass from the opening Einkehr and pretty much doesn’t let go over the course of nigh-on 90 minutes of sky-razing wonder. Should you wish to experience a rip in the space/time/mind/heart continuum right now, rejoice, because we have an exclusive premier in the form of the track Repulsion, which originally appeared on DWEF’s 2015 album, Stellar. It’s doomy, clean-vocal build up is just a laying of ground for the cataclysmic eruption that surges organically to map out an emotionally wrought requiem before throwing in a plaintive aftermath for good measure. 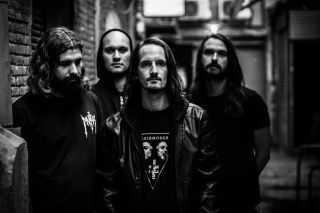 Surrender to the all-consuming rite that is Repulsion below, and scroll down further for an in-depth interview with Der Weg Einer Freiheit vocalist/guitarist Nikita Kamprad! What is your strongest memory from the Berlin show, and were there any aspects that were unique to the occasion? You have your 10-year anniversary this year. What are the biggest lessons you’ve learned over the last decade? If you were able to see 10 years ahead when you started, what would have been the biggest surprise? Germany has a rich and impactful cultural history – to what extent as your country’s art and literature inspired Der Weg Einer Freiheit, and what traits have you found most personally resonant? Black metal has always lent itself to very personal interpretations. Where do you stand on adhering to the original sprit and finding something true to yourself that might not have been in the original blueprint? Are there musical lines you won’t cross, and was there ever any discussion within the band about whether to adopt corpsepaint? “Corpsepaint was never really a topic in our band. From the start there was no need for me to wear paint or masks, on photos or on stage. It’s just like our music, it’s coming very naturally and I naturally haven’t had the need to change my outer appearance for that. "I think in the first interview I did about ten years ago I stated that DWEF will never be a live band and remains just a one-shot project. Also it was impossible for me to think to use electronics/synth in my music apart from just guitars, bass, drums and vocals (which also hasn’t been the case so far). So now – 10 years, six releases and hundreds of live shows later I find myself still doing interviews, writing new songs experimenting even with synth patterns and other new elements and still playing shows and tours – and enjoying the hell out of this all! I learned to never say never; you don’t know the person you are going to be in 10 years, so don’t restrict yourself from doing anything you want. That also counts for the music you do. That’s also what makes it so difficult for me to say what the next DWEF record will sound like (a frequently asked question) and when it will be released. I simply don’t know. You’ve had a few line-up changes over the years, including losing a founder member. How has this impacted the band, and would you say it forced you to evolve in any way? And pre-order Live In Berlin here!